Dr. Ignacio Ciampitti (Kansas State University) presented a webinar at the Plant Management Network related to the project "Closing Soybean Yield Gaps", a joint work of KSU, INTA Argentina, and Foundations MT and ABC of Brazil. The webinar has been sponsored by United Soybean Board (USB). 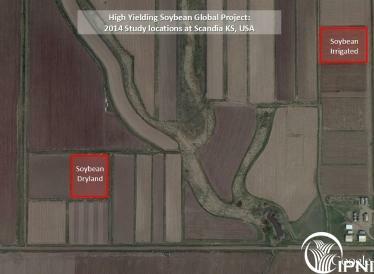 Two soybean research trials were conducted near Scandia, KS, in both dryland and irrigated environments during the 2014 and 2015 growing seasons. The objective of this research was to study the contribution of different farming practices for developing efficient and high-yielding soybean production systems. Each experiments had five treatments: farmer practices (FP), comprehensive fertilization (CF), production intensity (PI), ecological intensification (EI = CF+PI) and advanced plus (AD). Yield gap, potential minus on-farm yields, is primarily defined by management practices (M) and their interactions with the environment (E). By selecting best management practices farmers can close on-farm yield gaps. This study evaluated the contribution of varying farming systems in developing efficient and high-yielding (yield and nutrient uptake) systems in corn-soybean cropping rotations.